While some say the President has earned their trust and others are setting their sites on the next administration taking office a year and a half from now, there’s a quiet rebellion happening in detention centers across the country, a sea change of opinion that’s moving with it, and an urgency for the current President to do more. 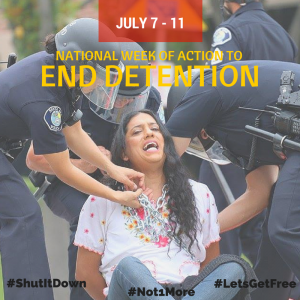 That’s why the #Not1More campaign is teaming up with Detention Watch Network, We Belong Together, Families for Freedom and others to plan a National Week of Action to end immigrant detention from July 7th to 11th. Right now over 100 people are on a hunger strike at Eloy detention center demanding an investigation into the recent deaths of fellow detainees in CCA custody. Women at the Berks detention center near Philadelphia are refusing to work (for $1 a day) and demanding their release. From inside and upon release, transgender women are shining a light on the physical, sexual and psychological abuse they face in custody. Meanwhile ICE is offering new forms and committees, tours and renovations, to try to quell the criticism. But a golden cage is still a cage and it’s time to close them down. Not just for the women or children or transgender detainees who have been leading the fight against detention over the past year, but for everyone. When any member of a family is taken away, the whole family is vulnerable. A system that “breeds cruelty and harm” should be shut down. Come back soon for more details and to add your event to the map!